First things first: empty the refrigerator. Next, clean any removable pieces. Do a quick once-over inside the fridge with a dry cloth. Clean the whole interior of the fridge with vinegar. Clean the refrigerator's outer surfaces. My poor fridge. I think it and the inside of my medicine cabinet should start an “out of sight, out of mind” support group together. Because while I was taking the pictures you’ll see below, I discovered that the shelves inside my refrigerator were still taped in to prevent them from shifting on their journey from the factory to my apartment. Which means we’d lived here for over a year and never actually cleaned the fridge. Easy though it may be for even a halfway decent housekeeper to put off cleaning the refrigerator, it is a relatively important chore. You wouldn’t eat off a dirty plate, and you shouldn’t store food in a dirty fridge. By the same logic, the products you use to clean your fridge are important. Harsh chemicals or strong fragrances that may be absorbed into your food should never be used for cleaning refrigerators. My own method, described below, works beautifully. I should really use it more often. Our unlcean fridge is your gain. First things first: empty the refrigerator. 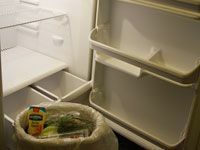 As you pull things out of the fridge, look at them closely and dispose of anything spoiled, expired, or unlikely to be used again before it spoils or expires. So that tuna salad that’s been sitting forgotten behind a gallon of milk for the past three weeks? Now is probably a good time to throw it away. Same goes for the bottle of oyster sauce you used in a stir fry recipe that one time, a year and a half ago. Next, clean any removable pieces. Take all of the shelves and crisper drawers out of the refrigerator and wash them in soapy water—I used Seventh Generation’s Natural Dish Liquid and a dishcloth. 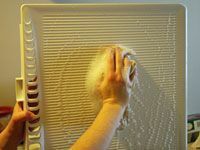 Then set the shelves and drawers aside to air dry or wipe them dry with a clean dish towel. Either way, leave them out of the fridge (and out of your way) while you complete the next two steps. Do a quick once-over inside the fridge with a dry cloth. 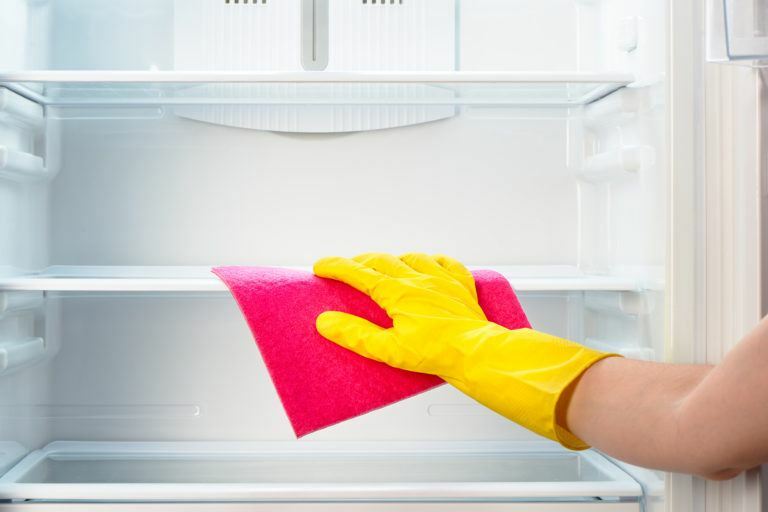 Wipe down the bottom of the refrigerator and any other horizontal surfaces with a dry rag or a paper towel to remove crumbs and other loose bits of debris before spraying anything inside the fridge. It’s an extra step, but it makes the following step quicker and easier because if it’s left there, that loose gunk clings to the damp rag and you end up just spreading it around. Clean the whole interior of the fridge with vinegar. 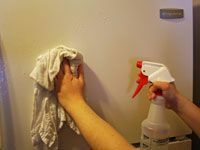 The easiest method is to use a spray bottle full of undiluted white vinegar—I keep one of these with my cleaning supplies at all times—to lightly coat the top, sides, bottom, and door of the refrigerator. Then wipe the whole thing down with a clean, dry cotton rag. Vinegar is perfect for cleaning the refrigerator because its acidity kills microbes such as bacteria and mold. And since vinegar is nontoxic and its odor dissipates quickly once it’s dry, there’s no need to rinse after cleaning. Reassemble the refrigerator. Put the clean, dry shelves and drawers back inside the fridge and load it back up with whatever food you didn’t throw out in step one. If you don’t already have one, it’s a good idea to stash an open box of baking soda somewhere in the back, out of the way, to absorb odors. If you do already have one but it’s been in there for more than a few months, replace it with a fresh box. Oh, and don’t use the baking soda from your refrigerator in baked goods. That’s just gross. Clean the refrigerator’s outer surfaces. 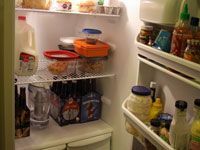 The outside of the fridge can get surprisingly grimy, so while you’ve got refrigerator sanitation on your mind, why stop at the inside? If your refrigerator is of the classic coated metal variety, go ahead and spray all the outer surfaces with your bottle of plain white vinegar and wipe them down with another clean, dry rag. Don’t forget to clean the door handles. If your fridge is fancier than mine, you can probably still use a variation on the vinegar method: plain white vinegar for stainless steel or glass; apple cider vinegar with a drizzle of olive oil for wood. Next, if you’re really feeling motivated, you can finish the job by cleaning the freezer. Spray undiluted white vinegar onto the mold and let it sit for an hour before wiping it off. Vinegar is acidic enough to kill about 80% of mold species. Wash the moldy surfaces using a solution of one cup borax to one gallon water. No need to rinse afterward; borax residue left in the fridge will help inhibit future mold growth. Apply undiluted hydrogen peroxide to the surface and let it sit for 10 minutes before wiping it away. Peroxide not only has antifungal properties, but can also help fade stains left behind by black mold. Mix a solution of one teaspoon tea tree oil to one cup water and use it to lightly coat the surface after cleaning. This will kill any remaining mold spores and help prevent new ones from propagating in the future. Put an open box of baking soda inside your refrigerator to absorb smells that would otherwise seep into your food or spoil your appetite every time you open the fridge door. 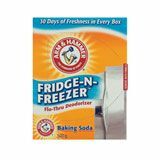 Arm & Hammer even offers a Fridge-n-Freezer Odor Absorber box with permeable panels to maximize the exposed surface area and eliminate spilling. Baking soda can also be used as a gentle, non-toxic scouring powder if you need to scrub away a crusty spill inside the refrigerator. If you’re not a fan of make-it-yourself cleaning products, Biokleen Spray & Wipe All-Purpose Cleaner is an excellent eco-friendly, non-toxic alternative to vinegar. Plus, it has a pleasant natural citrus fragrance. You can order Biokleen from Amazon. 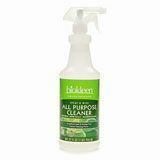 If you can’t find Biokleen products where you shop, or if you’d rather clean your refrigerator with something completely unscented, I recommend Seventh Generation Free & Clear Natural All Purpose Cleaner. 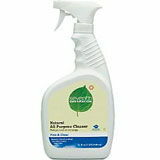 It’s not the most recognized brand of natural, sustainable cleaning products for nothing.